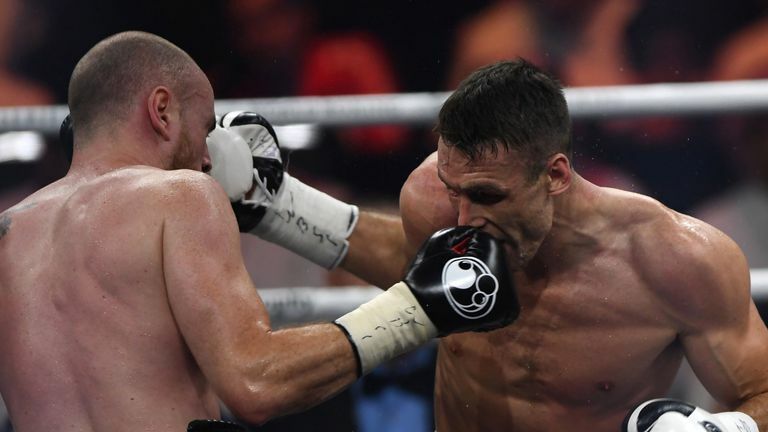 Callum Smith would "love to fight" Saul 'Canelo' Alvarez in Las Vegas, if the Mexican star marks his super-middleweight debut with a victory over Rocky Fielding. The two-weight world champion has made a surprise step up to the 168lb division to challenge Fielding for the WBA 'regular' title at New York's Madison Square Garden on December 15, live on Sky Sports. Having defeated George Groves in last month's World Boxing Super Series final, Smith now holds the WBA 'super' belt, and would relish a future battle with 'Canelo' in America's boxing capital. "Yeah of course. If he stays at super-middle, then I'll definitely be putting my name in the hat for his next fight at the weight," Smith told Sky Sports. "He's a special fighter, but I don't believe he's the biggest at super-middle, and I think that gives any super-middleweight a slight advantage over him, what they probably lack in ability up against him. "But if he stays there, then definitely I would love to fight him. Fighting 'Canelo' Alvarez in Vegas is another thing that I would like to tick off. I would be happy to go for the big fights now, and I don't think they come much bigger in my weight division than 'Canelo' Alvarez." Asked about Fielding's chances of a stunning upset, Smith added: "When you've got that much size advantage on anyone, it's got to give you a better chance than what you would have had, if they were on a similar height. "He's got a size advantage on the night, he will be a lot bigger, but I just think in terms of ability, 'Canelo' is a special fighter, and I think he wouldn't have chosen this fight, if he didn't believe he could go in and do a job on him." The 28-year-old Liverpudlian has decided to 'switch off' from boxing for a few weeks before considering his next fight, but he admitted that a rematch with Groves is not expected to be one of his possible options. "I think the tournament had a clause where they could do a rematch of the final, if they chose to, which we both had to sign, but that ran out," he said. "They had so many days to say whether they would use it, or not, and they haven't, so I don't think a George Groves rematch would be next. But you never know what is out there for me." Anfield remains the ideal venue for the first world title defence for Smith, who will keep an eye on this Saturday's WBA final eliminator between John Ryder and Andrey Sirotkin, with the winner becoming his mandatory challenger. "Listen, that's the plan. Anfield has always been the dream, and it was just a dream for a long time," said Smith. "Over the years, we've seen other fighters box at stadiums, so it is more realistic than it used to be, and I've won a world title now, so to defend it at Anfield, that would be something that I would tick off the list of things that I want to do as a pro. "If it's a voluntary or a unification, or whether I get a mandatory put on me, I have no idea. If he's [Ryder] my mandatory then he might have to [fit into future plans]. Every champion gets mandatories. "You've got to abide by them to keep your title, so if it gets mandated then it's a fight we'll have to take. "I haven't seen a lot of the lad he's fighting, the Russian. I believe he's unbeaten, and quite unknown. I like John, he's a good lad. "He seems a good honest pro and he's done things the hard way. He's had setbacks and he's come back, and he's coming off a good run of form. Good luck to him, and if our paths meet in the future then so be it."